Whilst on a wet, windy and out and out miserable weeks holiday in Northumberland, we decided to pay a visit to the beautiful Bamburgh Castle. We arrived on a grey, cloudy day and spent our time wandering around outside, walking round the castle walls and just simply exploring. Eventually, we made our way inside, just in time because the heavens opened and a thunderstorm started adding to the haunting mystery of the largest inhabited castle in England. Bamburgh Castle is situated on nine acres of land on an outcrop of volcanic dolerite overlooking the Northumberland coastline. The interior is breathtaking with many of the rooms refurbished to look like they did when the castle was first built in the 1100s. The medieval kitchen is amazing with its vaulted pantry, buttery, bakehouse and brewery. A passageway runs to the King's Hall which is a Victorian masterpiece where monarchs used to banquet. The keep which is the oldest part of the castle houses the armoury with its vast array of pikes, muskets, arms, armour and halberds. Other areas we visited were the library and clock tower, stables and Neville Tower. 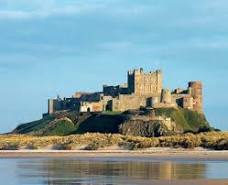 If you find yourself anywhere near the northeast, don't miss out on a trip to Bamburgh Castle, you won't regret it. Children will love it; little boys will want to be brave knights and little girls will dream of being fairy princesses. The whole place is steeped in history, the staff are friendly and informative and you can while away many a happy hour.